This Mother's Day, celebrate her DNA story. 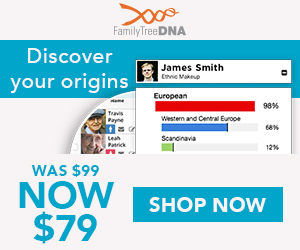 Order DNA test kits today at 23andme.com. Save $20. Hurry, offer ends May 14! I recall in the early days of Cyndi's List, 21 years ago, that I would work on the site for 2 hours a day, then 4, then 6, and so on. As the popularity of the Internet was exponentially growing, so was the number of resources online for genealogy. In order to keep up with the demand for links I just kept working more hours. I'm totally serious when I say this—I remember thinking that if I just kept working more hours I would eventually be caught up. For the past two decades I have worked an average of 10-12 hours each day on the site. And today I reached my personal milestone. Today I finally caught up. As I was inundated with email requests for new links or updates for links my email inbox grew and grew. In 1998 I added automated scripts to the site that would allow for those links to be published in the uncategorized area of Cyndi's List until I could get to them for categorization. From that point through December 2010 there was a steady number in that collection that always hovered around 10,000 links. I would chink away at the pile and take a thousand off just to have another thousand added. In the summer of 2016 I finally whittled away at the final month of links there. No more uncategorized links. Similarly, I automated the process to report a broken link to me. I spend just as much time fixing broken links each day as I do adding new links. After all, what would be the use of Cyndi's List if I didn't attempt to keep it as current as possible? The broken link reports submitted by users have also always piled up. Working to fix one broken link reported to me will often lead me to fix a dozen more in the same category or topic. I can't tell you how helpful it is to have you let me know when you run across a broken link. See How to Report a Broken Link Found on Cyndi's List. In 2011 Cyndi's List was upgraded to the current version. With that came a quicker backend interface that makes it easier for me to work on the site. From that point forward all new links have been categorized as they come in. They are completely caught up all the time. And from that point forward there has also always been a backlog of broken link reports that hovered around 2,500. People, excited to try out the new site, did a great job of reporting broken links. I would work to clear out a few hundred reports only to have a few hundred more added to the pile. I had almost decided that this would be the permanent state of things—a backlog that would always nag at me. But, I'm stubborn and I finally had enough. From about February 8th through May 10th, 2017 I have worked many long days doing nothing but clearing out the broken link report backlog. In those three months I added 2,783 new links, I updated 9,099 broken links, and I deleted 3,278 links. It's important to note those that were deleted because just as much research time was put into attempting to locate replacement addresses for those, without success in the end. In total I processed 15,160 links, which averaged anywhere from 200 to 250 links per day. Finally, as of right this moment, there are ZERO user-submitted broken link reports waiting for me. And ZERO user-submitted new links waiting for me. I am caught up. You have no idea how terrific this feels! Yes, it is really just one person that works on the site. Just me, but I couldn't do it without all of you. Thank you for your support of Cyndi's List and your help in keeping it as current as a web index can be. I appreciate you all so much!